To celebrate four years of bringing beautiful musical events to Baltimore, Gypsy Soul presented a show at Teavolve featuring Detroit singer/multi-instrumentalist Dwele, along with Nicholas Ryan Gant, and Green Tea. 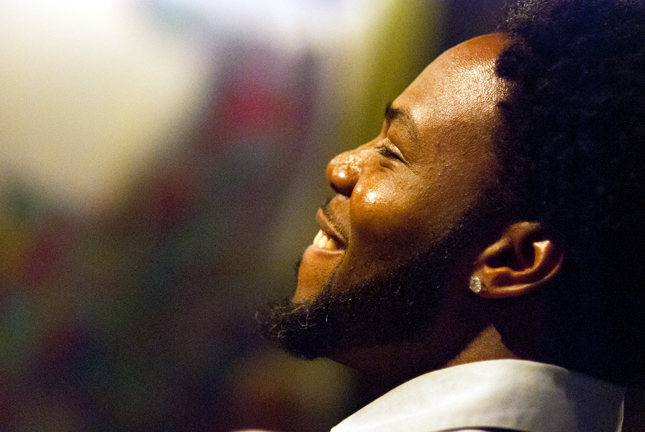 Before the show, Dwele sat down to answer some questions and talk about his music. Teavolve was packed to the gills for the performance. DJ Harvey Dent and DJ Phaze took turns on the tables before and after live sets from Green Tea (who also served as host for the evening), Nicholas Ryan Gant, and Dwele. Gant’s performance followed a storyline in which he meets a girl, falls for her, questions her taste due to her lack of knowledge of a blaxploitation character, then ultimately leaves and attempts to get over her. His cover of Curtis Mayfield’s “Makings of You” was nothing short of inspired–he certainly did the classic justice. Dwele’s set was short and sweet–emphasis on both short and on sweet. He sang a new song and “Find a Way” while walking through the center of Teavolve singing to a variety of women in the crowd. The atmosphere in the place was kind of like a refined bachelorette party. There were a lot of ladies in the crowd visibly swooning over Dwele, but it somehow managed to stay fun and playful without crossing over into the corny zone. Dwele’s voice sounded impeccable live and although he didn’t need to do anything to win over the already adoring crowd, his charming presence ensured their approval.